The most important step to any coating process – yet the one most often overlooked – is cleaning. 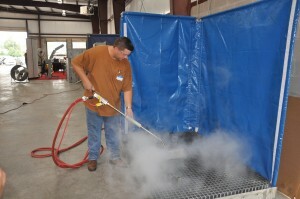 Steam units are intended for use as a cleaning appliance for metal substrates prior to paint or powder coating. They consist of two parts – a boiler and a steam wand. With more than 100 years combined experience, the Powder-X boiler design and manufacturing team has designed a compact boiler that uses dry steam for pretreatment prior to powder coating. It has significantly lower power consumption than other boilers on the market and has repeatedly exceeded our customers’ needs and expectations. The unique and proprietary design features of our boilers help reduce costs associated with installation and code compliance. They also heat up in a shorter amount of time and have a faster recovery time than other comparable size units, and they cost significantly less to operate. All Powder-X steam units include a water feed solenoid valve and a steam wand with a 25 foot hose. They are equipped with adjustable pressure control and manual reset hi-limit control, heavy-duty magnetic contractors, combination low water cut-off and water controller, 150-pound forged steel flange-mounted heating elements with stainless steel sheathing, solenoid valve, strainer, pressure gauge, ASME safety valve, check valve, blow down valve, 2-inch fiberglass insulation and encased with 20-gauge stainless steel jacket. Also includes high-pressure feed water pumping system assembled and wired to boiler. Powder-X boilers are built to the ASME/CSD-1 Boiler Code. Each boiler is UL listed for the United States and C-UL listed for Canada. A commissioned National Board Inspector inspects all boilers. These approvals ensure ease of installation and ready acceptance by jurisdictional and insurance inspectors.